BackgammonMasters has expanded their Game Lobby to include the new AstroPay Video Slot Game. The first in a series of video casino games, AstroPay gives BackgammonMasters.com players the complete casino experience in addition to their Blackjack, Poker, and Backgammon games and tournaments. All of BackgammonMasters games are home-grown, original, one-of-a-kind creations of the BackgammonMasters Game Development Team. “We’ve always been known for our high quality game experience and our superior graphics, the feedback from our players prompted us to offer more of their favorite games, if they’re coming to us to play, they know it’s going to be superior,” commented BackgammonMasters CEO, Jay Ryan. 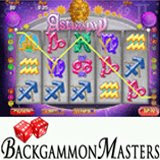 All of BackgammonMasters Games including AstroPay Slot Game are available in Play Money and Real Money games. BackgammonMasters has prepared themselves for the growing traffic to their platform by adding more operators to Live Chat Support feature in addition to their extensive articles, FAQ’s and Help files in order to handle the influx of new members who need assistance or have questions.